Benjamin Shayne told The Washington Post that he was sitting in his backyard Saturday night, when he first saw a plane making small loops over the part of Baltimore where rioting took place a few days earlier as a response to the death of Freddie Gray. Shayne tweeted his confusion and received a reply from fellow Baltimore citizen Pete Cimbolic, who linked the Federal Aviation Administration's website, which said the plane was registered to NG Research, and the Federal Bureau of Investigation later confirmed to the Post it had provided aircraft to the Baltimore Police Department, though it wouldn't comment on the exact flights. 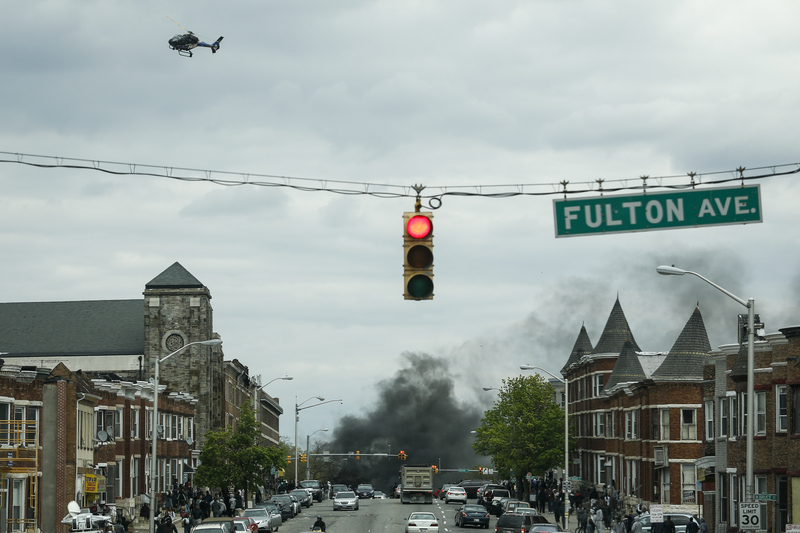 The American Civil Liberties Union has since accused the government of carrying out secret surveillance over Baltimore, according to the Post, "during a period of historic political protest and unrest." The FBI did not immediately respond to Bustle's request for comment. The safety and welfare of our communities is the highest priority for the FBI and our law enforcement partners. During the recent unrest, the FBI provided aircraft to the Baltimore Police Department for the purpose of providing aerial imagery of possible criminal activity. The aircraft were specifically used to assist in providing high-altitude observation of potential criminal activity to enable rapid response by police officers on the ground. The FBI aircraft were not there to monitor lawfully protected first amendment activity, and any FBI aviation support to a local law enforcement agency must receive high level approvals. Planes that have the latest surveillance technology can allegedly monitor larger areas than police helicopters and can take images of dozens of city blocks, which means they could be surveying people who aren't suspected of criminal activity, according to the Post. The two small planes apparently have sensors that have been used to gather intelligence in Iraq and Afghanistan, according to Ars, and they are also equipped with high-definition systems that can conduct surveillance during both the day and night. If these two planes are indeed sponsored by the FBI, as reports indicate, the Ars Technica article specifies that the exact number, basing location, and types of aircraft operated by the FBI's Surveillance and Aviation Branch are classified. The ACLU has since filed requests under the Freedom of Information Act for more details about the flights, according to ABC2 News. None of that can happen with regard to these flights. They are operated as if by secret police. The public has no way of evaluating the mission's content, propriety, or success. How can the people decide if they want to be governed in this way if they're not even told the substance of policies carried out in their name? And Baltimore's police department is low on the list of government entities that one would trust to avoid abuses while operating under cover of secrecy. A lot of these technologies sweep very, very broadly, and, at a minimum, the public should have a right to know what’s going on.